For one to six players, Castle Panic takes roughly sixty minutes to play. It is a cooperative fantasy board game. An oncoming horde of goblins, orcs, and trolls advance from the forest, intent on destroying the castle in the center of a clearing. The players work together to defeat the monsters as they attack the castle from all sides by deploying swordsmen, knights, and archers. Strategy changes from one turn to the next, so the players must have clear communication to win. Planning ahead and trading cards for a future turn may help to make sure that a monster is slain before it reaches the castle walls, but luck and chance can affect any semblance of a plan very quickly. There is the possibility that a plague could wipe out all the knights. Maybe each monster feels suddenly compelled to move an extra step forward. Perhaps a boulder comes along, demolishing everything in its path. These random events could drastically hinder any strategy; forcing the group to reevaluate and change tactics. Of course, the random events could also end up working in the favor of the players. That is the beauty of a luck aspect in a board game. The board has different colored and numbered zones. 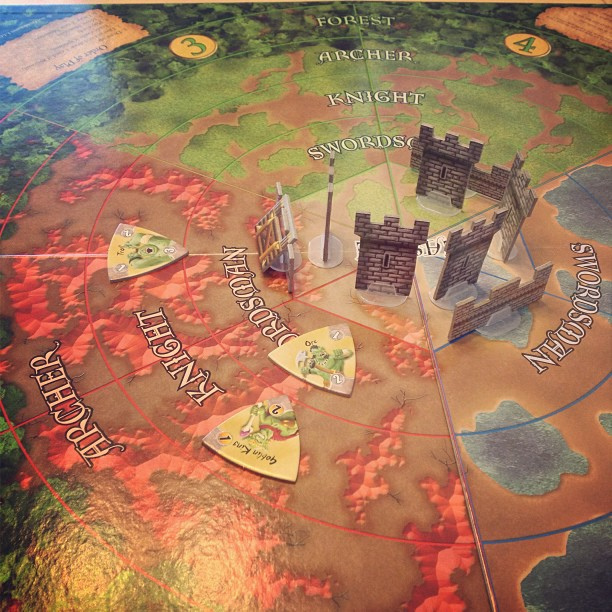 Each type of troop targets an area within these zones; swordsmen closest to the castle walls, knights in the middle, and archers farthest away from the castle. Cards other than troops (such as “Barbarian” and “Nice Shot”) add to the variety of strategies available, making it possible to have a plan “b” or “c” for when plan “a” fails. A card must match the color and area designation of the targeted monster to attack. Slain monsters become victory points. The castle cards are very glossy and seemingly durable. This makes shuffling them a little difficult until you get the hang of it. The monster tiles are nicely made triangles with curved edges and numbers in the corners. These numbers are the “hit points.” All you have to do is rotate the tile each time the monster is “hit” to keep track of how much life the monster has left, which is helpful, especially when a lot of monsters are on the board. The artwork is well done. What captured my attention most were the castle tiles. They fit into plastic stands and sit vertically on the board. The fortification tiles actually hang from the wall tiles. Nifty! As far as the instructions go, they are clearly written and simple to understand with extra rules and play variations at the end, including a single player option. The corners of the game board offer a handy quick-reference section with the most helpful information listed. Truthfully, I spent more time discussing strategy and socializing and less time looking at the game components. And isn’t bringing people together the real goal of gaming? Mission accomplished. 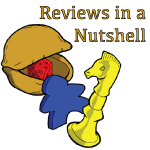 I played Castle Panic with three strangers on International Tabletop Game Day (April 5th.) Only one of us had played the game before, and he admitted that he had limited experience. We played our first round and lost … horribly. That trial run gave us greater insight into how the game worked. The second round was much more enjoyable. We had interesting discussions as we planned each player’s turn. There were moments in the beginning where cockiness got the better of us. Laugher and geekery ensued. By the end of the game we had one castle tower left and a troll at full hit points headed straight for it. The game hinged on fate. We managed to scrape by simply because one player drew the right card at the right time. And I victoriously became the “Master Slayer” with a total of 19 victory points. It was a great time and I had a lot of fun, but considering just how difficult this game was to win with four people diligently working together, I have the sneaking suspicion that it wouldn’t be as enjoyable with two players. Like with most cooperative games, your group dynamic plays a big role in how much fun you have. With the right group of players, I would happily play Castle Panic again.